University of Texas Medical Branch, Departments of Pathology and Obstetrics & Gynecology, Galveston, TX, U.S.A. This was a 29-week gestational age newborn male infant born to a 20 year-old primigravid, Caucasian woman, after prolonged premature rupture of membranes. 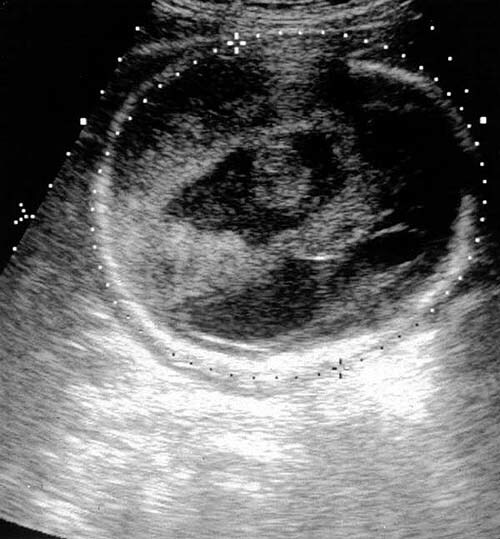 Two weeks before spontaneous vaginal delivery, a routine prenatal ultrasound had shown moderate hydrocephalus and distorted intracranial anatomy, with an echogenic mass in the third ventricle. His neurologic outcome could not be predicted at that time. At the time of delivery he was limp, bradycardic, and had Apgar scores of 3 and 5 at one and five minutes, respectively. He was found to have hydrocephalus and ascites. A CT scan of the head revealed extensive hemorrhage, parenchymal infarction, and numerous calcifications. He was immediately intubated and placed on mechanical ventilation. Prophylactic surfactant and antimicrobial therapy were started. A chest X-ray revealed severe hyaline membrane disease. Multiple decompressive ventricular taps were performed showing a hemorrhagic cerebrospinal fluid (CSF) with no evidence of infection. No malignant cells were detected on CSF smears. Toxoplasma and RPR serologies were negative. Despite supportive treatment, his condition progressively deteriorated. He became more edematous and hyperkalemic, with a progressive decrease in urinary output. He died four days after birth. 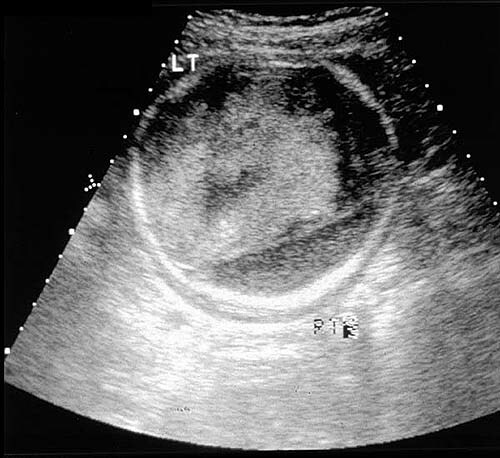 Two weeks before delivery a routine ultrasound examination showed a fetus with moderate hydrocephalus (ventricular width 1.7 cm) (Fig. 1). The third ventricle was dilated (2.5 cm) and contained a prominent echogenic mass (Fig. 2). The cerebellum and posterior fossa were not well visualized. Organized thrombus and tumor were considered in the differential diagnosis. 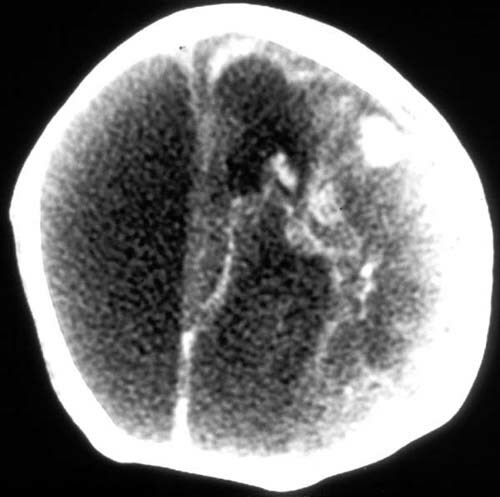 Shortly after delivery, CT scan of the head without contrast revealed hydrocephalus involving all ventricles, and amorphous tissue over the left convexity with numerous areas of calcification (Fig. 3). Intrauterine infections, including toxoplasmosis, and primitive brain tumor were considered in the differential diagnosis.